15 prime slabs of mid-60s USA garage punk MISERY - garage punk SADness in GATEFOLD SLEEVED luxury with liner notes, band photos, label scans. 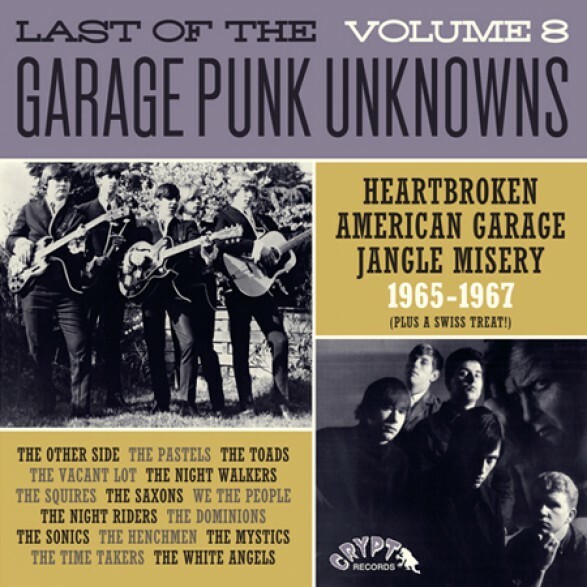 (NOTE: This is an entirely NEW series and NONE of these tracks were on the old series “GARAGE PUNK UNKNOWNS”). The Other Side "DARK SIDE", The Pastels "HOW MANY NIGHTS", The Toads "STAY AWAY", The Henchmen "SHE STILL LOVES YOU", The Night Walkers "STIX AND STONES", The Time Takers "LOVE ME LIKE YOU DID BEFORE", The Night Riders "SHE WON'T MISS YOU", The White Angels "BUT HE NEVER COMES BACK", 24. We The People “ALWAYS LIES”, The Dominions "I NEED HER", The Saxons "THE WAY OF THE DOWN", The Sonics "YOU DON'T HEAR ME", The Mystics "ORPHAN", The Vacant Lot "HEY BABY". The Squires "WHY OH WHY"